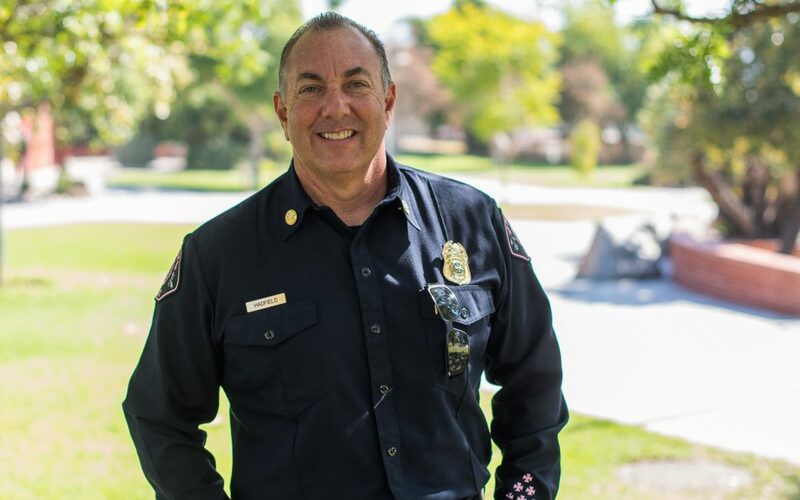 Nearly 30 years after graduating with the Palomar College Fire Academy’s first class, Ed Hadfield is back in North County as Chief of the Rincon Fire Department. SAN MARCOS — Ed Hadfield was among the first firefighters to graduate from the Palomar College Fire Academy when they walked across the stage for their diplomas in the early 1990s. He had started his career just a few miles away from the college as a reserve firefighter with the Deer Springs Fire Department, and he would go on to teach at Palomar for several years after graduation. Thus began a lengthy career in the fire service that took Hadfield all over California, as he moved up through the ranks; including posts as Division Chief in Coronado, in 2007, and Deputy Chief in Santa Maria from 2013-15. Three years ago, Hadfield came back to North County as the Fire Chief of the Rincon Fire Department, headquartered just south of Harrah’s on Valley Center Road. The department is administered by the Rincon Band of Luiseño Indians, and Hadfield reports to the tribal council. “Our territory is very unique—we have high-rise hotels, we have large convention centers, we have large casinos that we protect,” said Hadfield. “But at the same time, we have a very rural area. As a firefighter, you have to be very well-versed in all of it: You have to understand high-rise commercial operations and over-the-side rescues. “Our firefighters are very balanced and very good at all aspects of the craft,” he added. As one of 10 local fire departments that partner with Palomar College, Rincon recently began hosting a Palomar class, FIRE 98, at the department’s facilities, where Rincon firefighters can earn college credit and satisfy training requirements while on duty. “We are extremely excited to be the first fire department serving a tribal organization in the state of California to have partnered with a local community college” in a program like this, Hadfield said. Palomar College Fire Academy Director Dave Miller said firefighters are required to renew certain requirements annually, and the FIRE 98 curriculum is designed to meet those requirements. “We help departments encourage ongoing training by making their employees students of the college while they’re at work,” Miller explained. As for the Fire Academy at Palomar College, students must complete 650 hours, attending full-time, five days a week. The 54th academy is in session as of October 2018. Hadfield said his department goes out of its way to hire firefighters from Palomar’s program. Hadfield said he would like to teach again, given the opportunity, as a way to give back after a long career in California’s fire services.